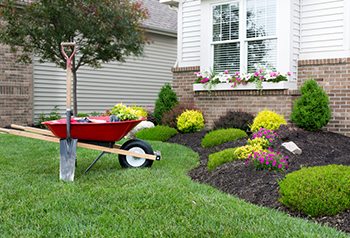 Home | Blog | Who is responsible when there is an injured landscaper on your property? With warmer weather on the horizon, southcentral Pennsylvanians are preparing for tidier lawns and gardens. If you’re considering hiring a landscaping company, you might be thinking of questions such as: How much is the average price for these tasks? Who has the best reputation? Does it make more sense to hire an independent contractor or a national company? With these other questions in mind, it might be easy to overlook: Is the landscaping contractor properly insured? In 2017, 40 percent of Americans with a lawn or landscape hired a professional. Unfortunately, sometimes too late homeowners are taken aback to learn the possible liabilities associated with hiring a lawn care professional. If you hire a company that does not insure all employees that are on your property, you could potentially be held responsible for any injured landscapers. Most states require workers to have insurance. Yet, you should still make sure they are insured and ask to see their up-to-date certificates of insurance. They can be insured and have a license but have let time lapse causing all their employees to be uninsured, leaving you liable for any injuries that occur. Some homeowners believe they are safe to use uninsured contractors, assuming that injuries will be covered under their own homeowner’s insurance policy. However, that is not always the case. Having the proper homeowner’s insurance can reduce the chance of being personally responsible for injuries. Most homeowner policies require that any work on the property be done by a licensed contractor. It is important to know what kind of coverage you have and if you should raise the limits. Prior to hiring a landscape company, you should take a few items into consideration to make sure you are not responsible for injuries that may occur. You should be aware of what your homeowner’s insurance policy covers. The policies vary state by state and also by insurance carrier. As well, you should ask for up-to-date business licenses, workers’ compensation insurance and general liability insurance. Accidents can happen at any time. If you or someone you know experiences an injury, reach out to a KBG Injury lawyer to get the Results You DeserveÒ.